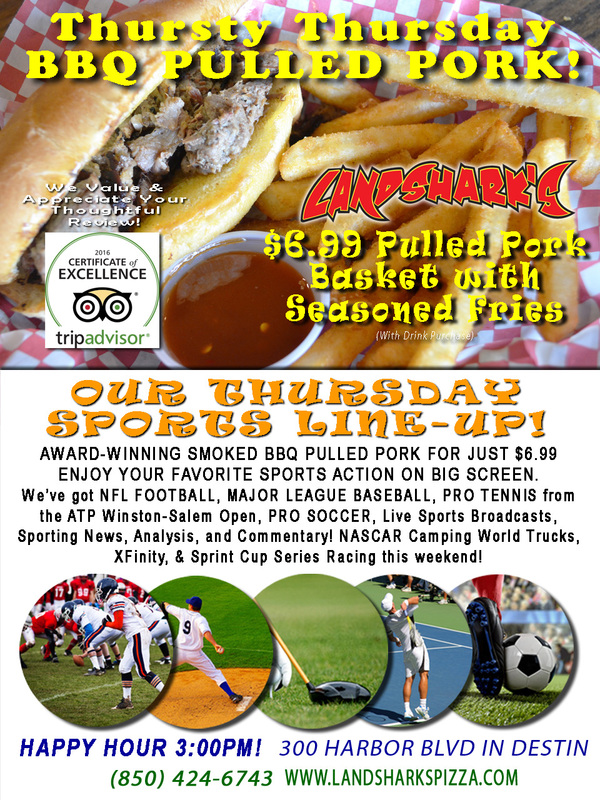 / Destin FL Award-Winning BBQ / Great BBQ, FANTASTIC Price $6.99 Award-Winning Smoked Pulled Pork NFL FOOTBALL on Tap! Great BBQ, FANTASTIC Price $6.99 Award-Winning Smoked Pulled Pork NFL FOOTBALL on Tap! We’re talkin’ an AWARD-WINNING dish featuring our own deliciously tender, fall-off-the-bone smoked pulled pork BBQ and succulent seasoned fries that will light up your day! Only $6.99 with a drink purchase. 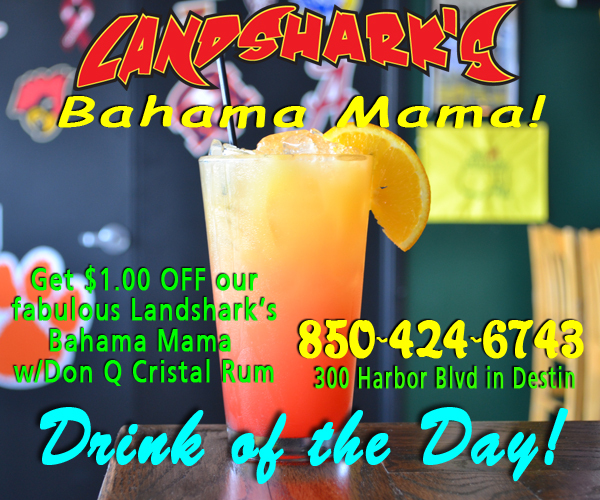 LANDSHARK’S DRINK OF THE DAY – $1.00 OFF our BAHAMA MAMA cocktail made with Don Q Cristal Rum. It’s like putting a rainbow in your mouth! 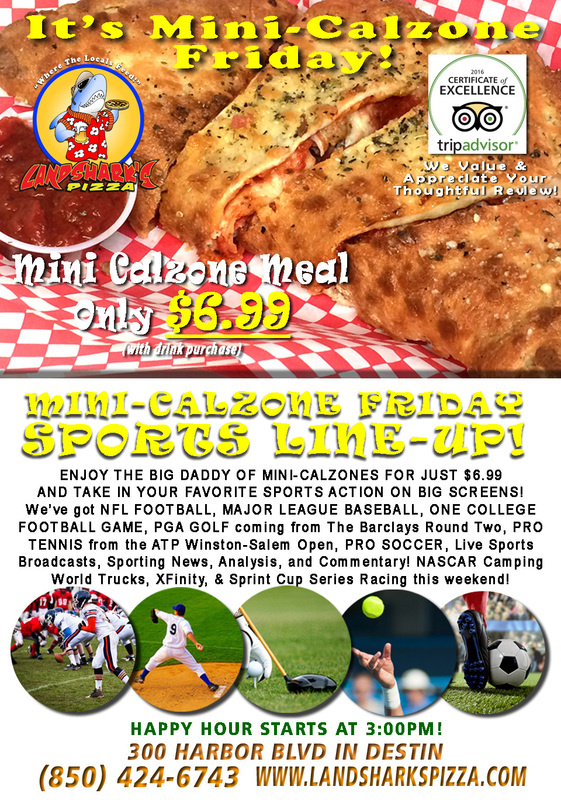 SPORTS ON OUR ARMY OF BIG SCREENS – Today we’re showin’ NFL FOOTBALL, MAJOR LEAGUE BASEBALL, PRO SOCCER, PRO TENNIS, PGA Tour 1st Round Action from The Barclays at Bethpage Black with $8,500,00.00 on the line, plus plenty of other Sports Broadcasts, Sporting News, Analysis, and Commentary! NFL This Week: Four straight days Thursday through Sunday of smash-mouth, desperation football as overbloated pre-season teams are forced to whittle away the weak to forge a core of mighty warriors fighting to get to the Superbowl! NCAA College FOOTBALL on Friday: California vs. Hawaii! Get a taste of College Football before it unleashes September 1st! View our FULL ONLINE MENU – check it out by simply using your Mobile Phone when you go to our website or on Facebook using the ‘Menu App’ on the left hand side under Apps. JUST FOR YOU, WE’VE A FULL SELECTION OF ADULT BEVERAGES & COCKTAILS – from Top Shelf Bourbons, Whiskeys & Vodkas, Scotch’s & Gins, Tequila’s & more to our Jester Series Daquiries & Margaritas. Local & Regional Brewery Beer selections, Domestic & Imports, and Wines. Previous Post: « HUMPDAY in Destin! 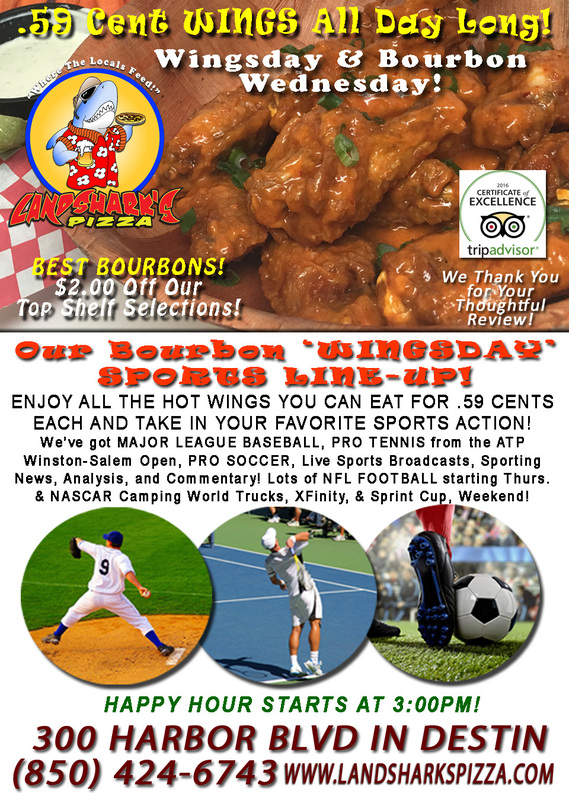 Award-Winning Wings 59-CENTS each ALL DAY Today – $2 Off All Top Shelf Bourbons!